Crab spiders are commonly found in home gardens and landscapes. They are generalist predators, meaning they feed on a diversity of arthropods. Crab spiders can be contributors to biological control, where feeding by natural enemies results in a reduction of pest populations. In addition to hunting insects, they also feed on pollen and even nectar. Growing a diversity of flowering plants will provide spiders with protein and sugar, to sustain them in times of low prey availability. 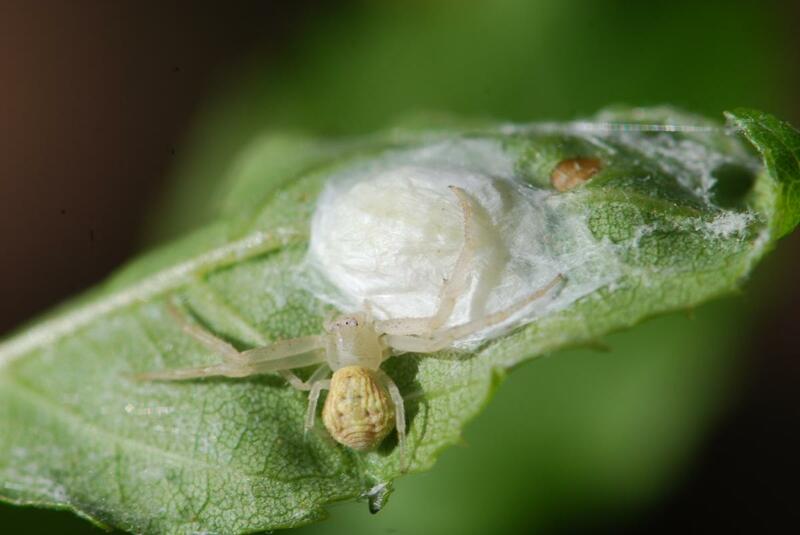 Also, avoiding the use of broad spectrum insecticides such as pyrethroids or carbamates is advised to promote crab spider populations and encourage biological control in the garden. Like all arachnids, crab spiders have a two-segmented body consisting of a prosoma (cephalothorax) and an opisthosoma (abdomen). They have four pairs of legs and one pair of pedipalps on their prosoma. Pedipalps are short appendages near their chelicerae, or mouthparts, which serve sensory functions, assist with prey capture and feeding and are even utilized in mating. Crab spiders get their name from their crablike appearance, and their ability to walk sideways. They are small- to medium-sized spiders, with a body length of 2-11 mm. Their body is somewhat flattened and they have stout robust legs. A crab spider’s front two pairs of legs are longer than the third and fourth pairs. They have eight relatively equally sized eyes. A crab spider’s relatively small eyes can only detect prey at very close distances, but they can detect motion up to 20 cm away. 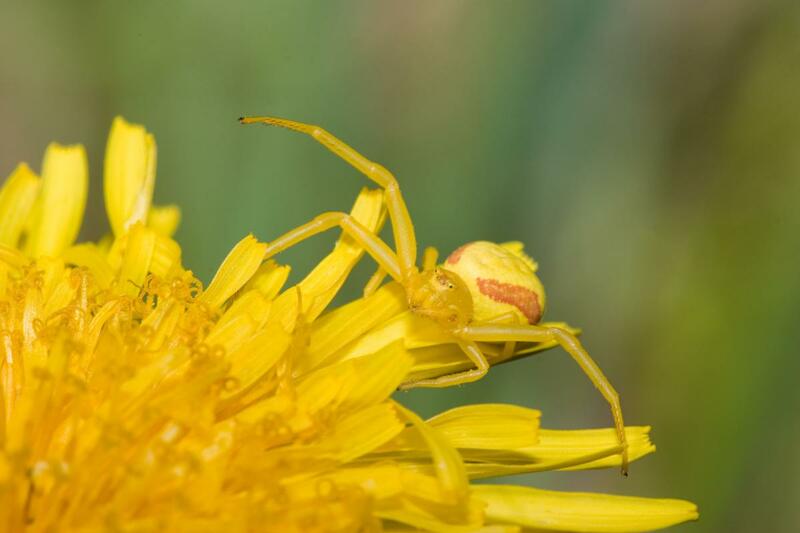 Crab spiders are sit-and-wait predators, meaning they hunt motionless until a potential prey item comes within their grasp. Crab spiders capture their prey with their front two pairs of legs and bite it, injecting venom to paralyze their meal. The use of venom to cause paralysis allows crab spiders to capture and consume even large insects. The hunting ground of crab spiders varies among species. They may hunt on the soil surface, leaf litter, mulch, trees and shrubs, or garden plant leaves, stems or flowers. 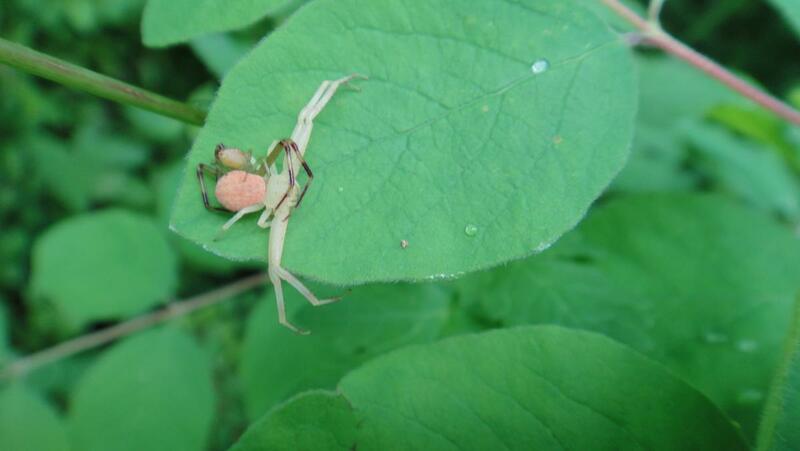 Crab spiders do not build webs, but do use silk to attach drop lines to vegetation. If the spider becomes dislodged when attempting to capture a meal it can use the drop line to climb back into position. Crab spiders feed on a diversity of other arthropods including insects considered garden pests, but also beneficial insects such as bees and other spiders. 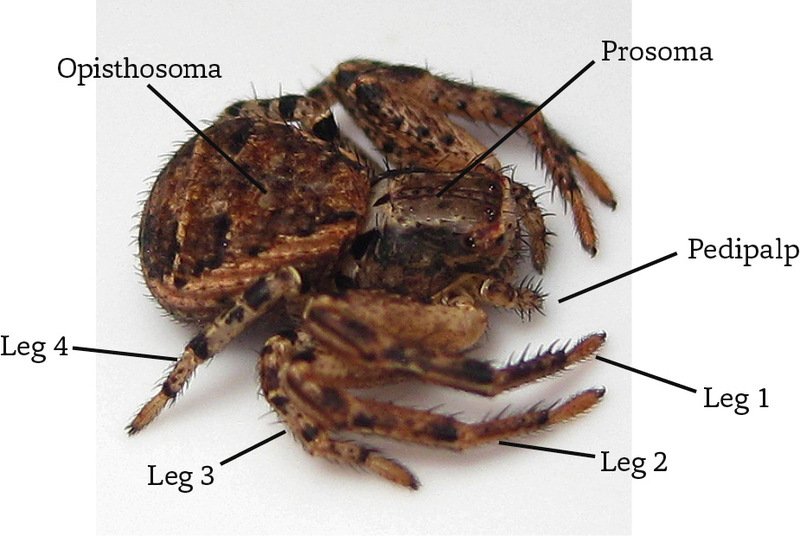 Like all spiders, Thomisidae have two body regions, a prosoma and an opisthosoma. They have four pairs of legs, pedipalps, eight eyes, and chelicera on their prosoma. The opisthosoma or abdomen includes the lung slits (for breathing), spinnerets (to produce silk) and the epigastric furrow which houses the internal reproductive organs. Females also have an epigynum, an external reproductive structure that accepts sperm from the male’s palp during mating (Photos: John Maxwell: full body; and Iustin Cret: eyes and abdomen). When they reach the adult stage, male crab spiders must locate a reproductive female. It’s not fully understood how males find their mate, but they may use airborne pheromones or visual cues, and some species are known to follow drop lines left by other spiders. Once a male locates a female, courtship and potentially mating will follow. In some species this courtship includes the male covering the female loosely with strands of silk; this does not restrict her movement and is thought of as a form of courtship—referred to as a bridal veil. Spiders do not mate directly like insects do. Instead the male deposits sperm onto a small web he constructs specifically for this purpose; he then uses his pedipalp to take up the sperm from the web and store it. He will then use his pedipalp to inseminate the female. When ready to lay her eggs the female will find a protected location, or create one using silk to roll a leaf into a protective structure. She will guard her eggs until they hatch. Crab spiders develop via gradual metamorphosis, meaning they hatch from an egg and undergo several molts as a juvenile before eventually becoming a reproductive adult without entering a pupal stage. Most crab spiders species will have one generation per year in Ohio. They overwinter as either eggs or immatures. (Photo Kim Moore). The hunting spot selected by this northern crab spider, Mecaphesa asperata, is somewhat precarious. This spider has attached a drop line; if it is dislodged during prey capture it can regain its position and try again (Photo: Dan Leeder). 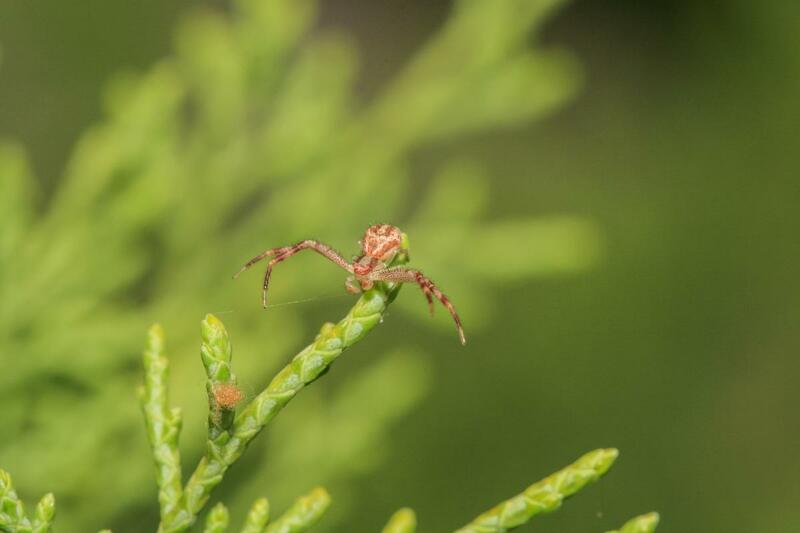 Approximately 30 species of crab spiders have been documented in Ohio. 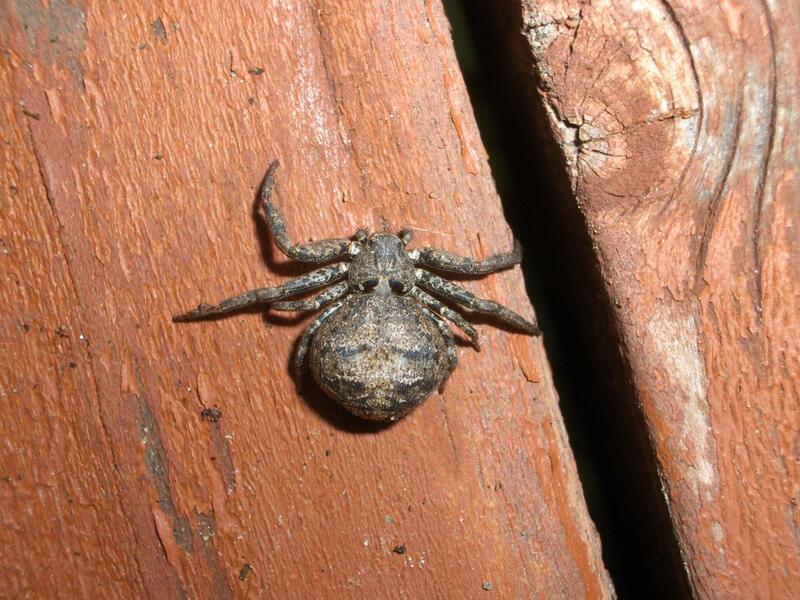 Several species of crab spiders in the genera Xysticus and Ozyptila can be found, which range in color from light grey to dark brown and black and blend in well with mulch, soil and leaf litter. 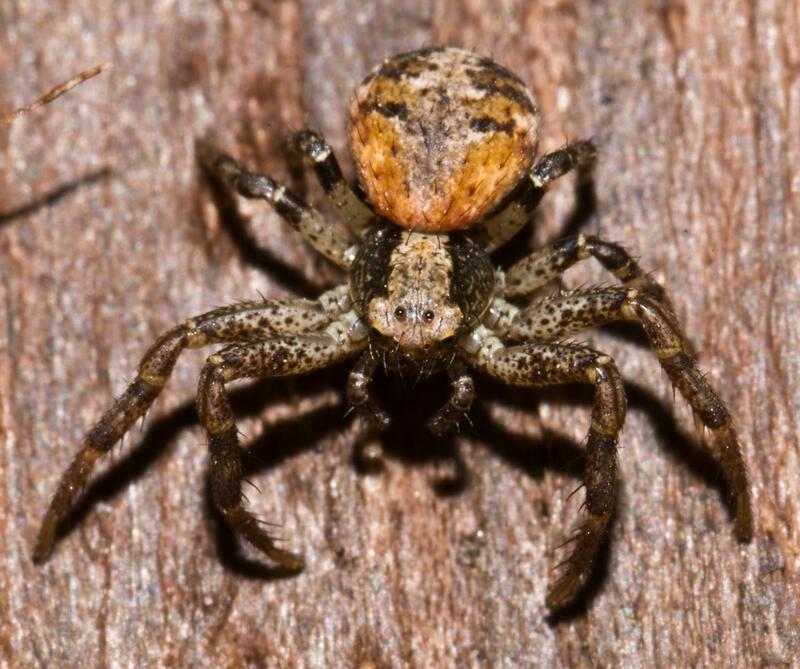 The bark crab spider, Bassaniana versicolor, has a mottled brown to black coloration that camouflages this spider well. Species that use flowers as hunting grounds tend to be brightly colored to blend in with their surroundings. 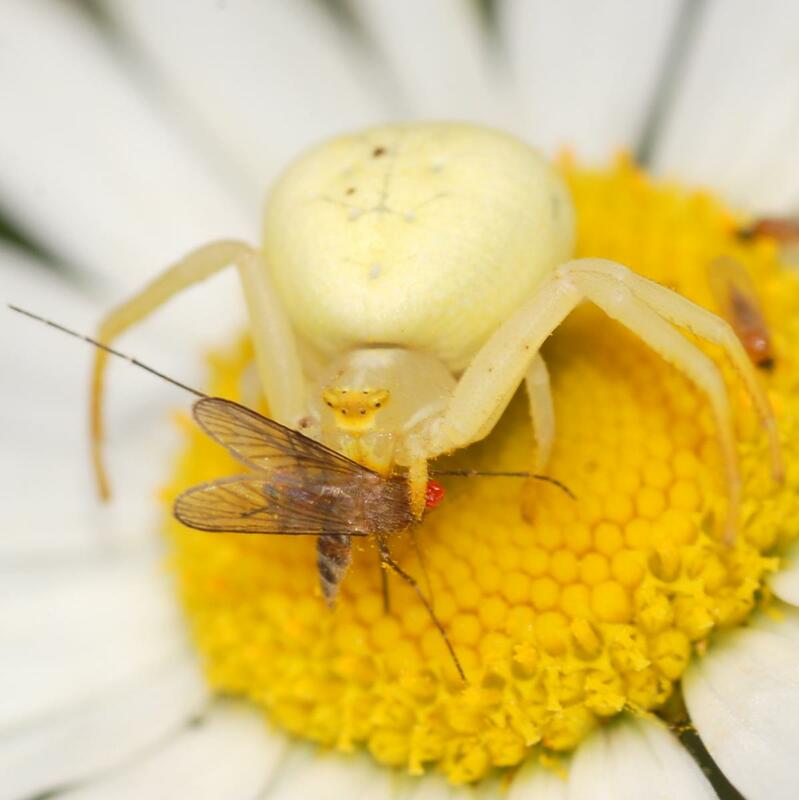 The goldenrod crab spider, Misumena vatia, and white banded crab spider, Misumenoides formosipes, are even able to change color from white to yellow in response to the color of the flowers it is hunting within. These spiders produce pigments called ommochromes, which catalyze this color change in an outer layer of cells on their bodies. Changing color happens within just a few days, and the spider is able to change back to its white coloration as well. where these species hunt (Photos: Xysticus: Harvey Schmidt; Bassaniana: Carol Davis). its own predators such as wasps and birds (Photo: Peter Hollinger: yellow; and Charley Eiseman: white). Anderson, J.T., and D.H. Morse. 2001. 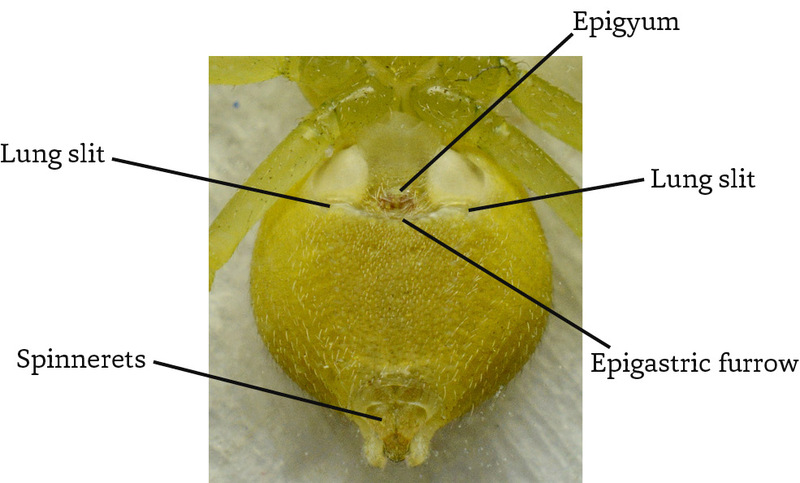 Pick-up lines: Cues used by male crab spiders to find reproductive females. Behavioral Ecology 12: 360-366. Bradley, R. 2015. The provisional list of Ohio spiders. osumarion.osu.edu/SpiderWeb/provisional_spider_list.pdf. Kaston, B.J. How to Know the Spiders. 1953. W.M. C. Brown Company Publishers. Dubuque, IA. 220 pages. Pollard, S.D., M.W. Beck, and G.N. Dodson. 1995. 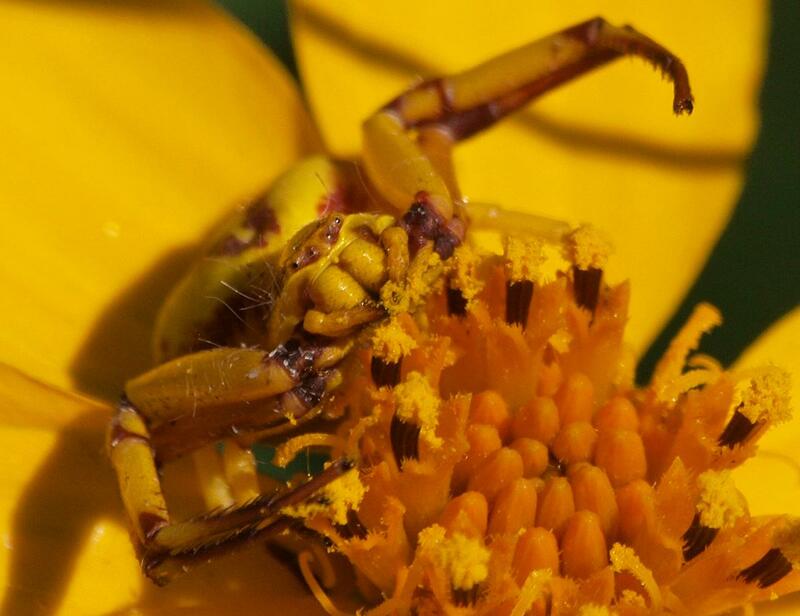 Why do male crab spiders drink nectar? Animal Behaviour 49: 1443-1448. Robinson, M.H. 1982. Courtship and mating behavior in spiders. Annual Review of Entomology 27: 1-20.